Edge detection filters focus on finding sharp contrast or border between colors in an image to create edges or lines. Since 4.0 there are only two edge detection filters. A general edge detection filter that encapsulates all other filters. Edge detection filters that were separate before 4.0 have been folded into this one. It is also available for filter layers and filter brushes. The convolution kernel formula for the edge detection. The difference between these is subtle, but still worth experimenting with. A Kernel that is not square unlike the other two, and while this makes it fast, it doesn’t take diagonal pixels into account. A square kernel that includes the diagonal pixels just as strongly as the orthogonal pixels. Gives a very strong effect. A square kernel that includes the diagonal pixels slightly less strong than the orthogonal pixels. Gives a more subtle effect than Prewitt. Convolves the edge detection into all directions and combines the result with the Pythagorean theorem. This will be good for most uses. This only detects changes going from top to bottom and thus only has top lines. This only detects changes going from bottom to top and thus only has bottom lines. This only detects changes going from right to left and thus only has right lines. This only detects changes going from left to right and thus only has left lines. This convolves into all directions and then tries to output the direction of the line in radians. The radius of the edge detection. Default is 1 and going higher will increase the thickness of the lines. Apply result to Alpha Channel. The edge detection will be used on a grayscale copy of the image, and the output will be onto the alpha channel of the image, meaning it will output lines only. 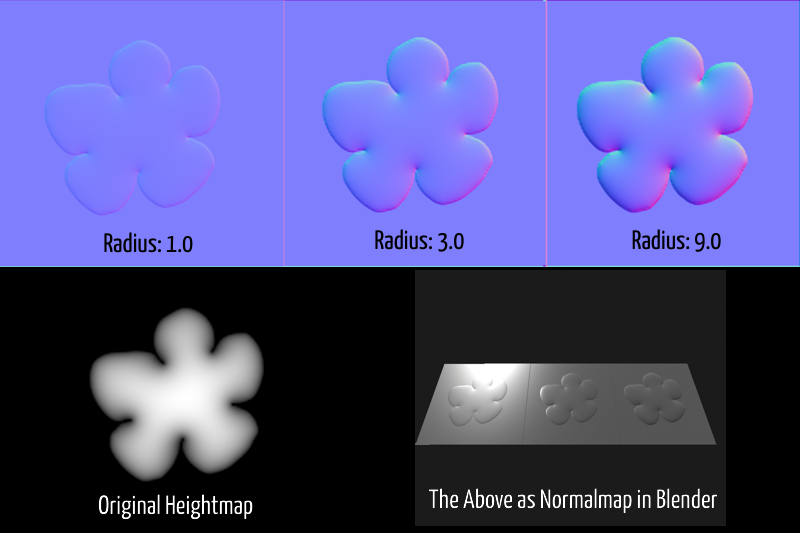 A filter that converts Height maps to Normal maps through the power of edge detection. It is also available for the filter layer or filter brush. Which channel of the layer should be interpreted as the grayscale heightmap. The radius of the edge detection. Default is 1 and going higher will increase the strength of the normal map. Adjust this if the effect of the resulting normal map is too weak. An XYZ swizzle, that allows you to map Red, Green and Blue to different 3d normal vector coordinates. This is necessary mostly for the difference between Mikkt-space normal maps (+X, +Y, +Z) and the OpenGL standard normal map (+X, -Y, +Z).